Jeff is currently on vacation and the eFiling series will resume upon his return with part 2 – Electronic Court Filing Standards. One year we signed her up for the city’s spring youth run. Great fun, good exercise, flashy medal…. The only problem was, she didn’t feel like running that day. Now, most kids, surrounded by several hundred OTHER kids, not to mention countless adult supervisors, would have at least tried to keep up with the pack to avoid being identified as the one slow-poke. Not my daughter. In an impressive display of disregard for peer pressure and fear of public humiliation, she strolled. By the end, the adults around her were imploring her to pick up the pace; all to no avail. Meanwhile, the audience, the other runners, and the subsequent heats all waited. And waited. My daughter has since grown up to be a formidable, high-performance, successful professional. Interestingly, she uses BOTH traits to her advantage. So maybe she knew what she was doing. But the wait was STILL frustrating. With these fond memories in mind, I consider Chief Justice John Roberts’s Report, wherein he discusses the nature and change of technology, particularly Electronic Case Management, Electronic Document Management, and Electronic Filing, in the Supreme Court and in the courts in general. He unabashedly acknowledges not only the usually slow pace of court adoption of new technology, but that the slowness of the pace and resistance to change is in many ways intentional. “[T]he courts will often choose to be late to the harvest of American ingenuity. Courts are simply different in important respects when it comes to adopting technology, including information technology. While courts routinely consider evidence and issue decisions concerning the latest technological advances, they have proceeded cautiously when it comes to adopting new technologies in certain aspects of their own operations…. “…Federal judges are stewards of a judicial system that has served the Nation effectively for more than two centuries. Like other centuries-old institutions, courts may have practices that seem archaic and inefficient — and some are. But others rest on traditions that embody intangible wisdom. Judges and court executives are understandably circumspect in introducing change to a court system that works well until they are satisfied that they are introducing change for the good…. OK. Some are waiting. But more and more courts are past waiting. ECM and eFiling have in fact become mainstream and of proven reliability. Most courts and their constituents simply cannot afford to eschew their clear advantages. With all due respect to SCOTUS, the courts serve the people; and next race to meet the increasingly complex and pressing societal need for judicial services is well under way. 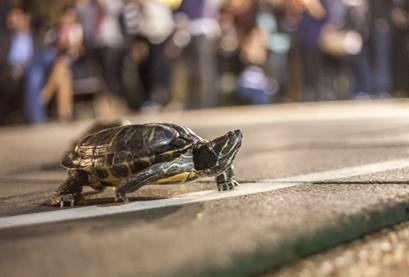 The tortoise never wins the race without pressing deliberately forward. Next postElectronic Court Filing Standards: What, Why, and Where are They Headed? Isn’t the Chief Justice of the U.S. Supreme Court named John Roberts, not John Richards? Did you mean Supreme Court Justice Roberts?